SPEAKING at the Dublin Book Festival on Friday, 6 March during a debate on the ‘Past and Future of Dáil Éireann’, Sinn Féin President Gerry Adams reiterated the call he made at the party’s Ard Fheis for a new political alliance for change. Adams pointed out that the First Dáil was an all-Ireland Dáil and represented the democratic will of the Irish people but was thwarted by the British Government. 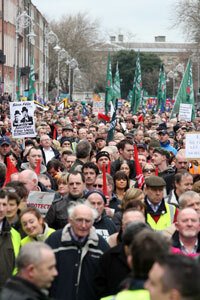 “We still do not have an all-Ireland Dáil. The future of the Dáil that I want to see is that it will truly be Dáil Éireann – the national legislature of an Ireland that does not stop at Dundalk or Monaghan or Letterkenny”. “So in this 90th anniversary we all need to re-focus on the question of Irish reunification, the ending of the role of the British government in Ireland and the coming together of the people of Ireland in a national conversation about how best we can share this island”, Adams said. Speaking about the current economic crisis Adams argued for the need for a coming together of people on the left of Irish politics. This would include Sinn Féin, the Labour Party, other smaller left parties, trade unions, community organisations and other NGOs. “Crucially such a new alliance would need to become far greater than the sum of its parts. It would not be enough just to create a more coherent left opposition in the Dáil and push the two conservative parties, Fianna Fáil and Fine Gael, together. That could become a recipe for the left being in permanent opposition. “What is needed is a much greater project. For a truly new Dáil Éireann we need to build a grassroots movement for progressive change and social justice across this country, which the left parties and groups in alliance would help to mobilise, but which would take on a dynamic of its own”, Adams said. “I believe there is the potential for such a transformation because many more people are becoming politicised by the current crisis. There is an opening up to ideas and alternatives and a realisation that bad political decisions and bad economic decisions are now deeply affecting people in their daily lives with job losses, pay cuts and cuts in public services”, he said. The Sinn Féin President said that at times like this there is also great fear and anger and there was a danger that for many this can turn into “despondency, hopelessness, apathy and racism”. “We need to show people there is a better way. The left in general needs to do a better job in presenting its case and mobilising support. We need to set aside petty differences and see the bigger picture.